AN ISLAND IS A LANDMASS smaller than a continent surrounded by water. The largest islands are GREENLAND, NEW GUINEA, BORNEO, MADAGASCAR, Baffin Island, and SUMATRA. 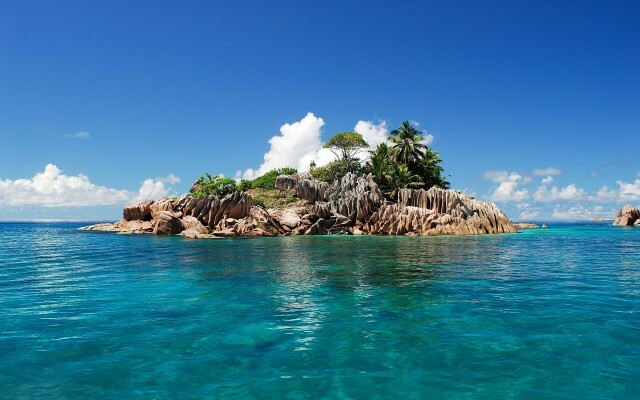 The smallest islands are a few square miles or kilometers. An extended line of islands is an island chain. A cluster of islands is an archipelago. Islands are of either the continental, oceanic, or coral type. A continental island is an exposed part of a continental shelf. The largest islands are of this type. Either tectonic subsidence or melting glaciers, or a combination of both, causes the edge of the ocean to spread over a continent to create islands. Narrow and shallow waters (straits) separate the islands from the larger landmass. During glacial periods, the sea level was much lower and land bridges joined such islands to continents. For this reason, continental islands’ plants and wildlife, as well as their geology, are similar to those of the nearby mainland. Entire nations can be continental islands, such as IRELAND and MADAGASCAR. Other such islands can be parts of larger political entities. Vancouver Island, for instance, is part of the Canadian Province of British Columbia. Examples of prominent continental islands belonging to U.S. states are Kodiak Island (ALASKA) and Long Island (NEW YORK). Continental islands do not have to be solid rock extensions of continents. Some are large deposits left by glaciers on continental shelves. For example, in the United States, part of Long Island, New York, is a glacier’s terminal moraine and so are parts of Nantucket Island and Martha’s Vineyard, MASSACHUSETTS. Additionally, ocean waves, and longshore currents deposit sand to form small-scale barrier islands that parallel shorelines. The U.S. southeast coast and gulf coast are classic examples of such shorelines. An oceanic island is generally a single volcano, an assemblage of volcanoes, or a volcanic plateau that grew from the deep ocean floor rather than a continental shelf. Many island countries are oceanic islands, ranging from relatively large ones, such as ICELAND, NEW ZEALAND and PHILIPPINES, to smaller groupings, such as FIJI and FRENCH POLYNESIA. It takes an enormous pile of lava to accumulate before a volcano or plateau breaches the surface water. Geographers call an oceanic island a high island because it is mountainous with rugged peaks. When a volcano of an oceanic island erupts, its flanks shudder spasmodically against the water to create seismic sea waves (TSUNAMIS). The largest TSUNAMI can travel across an ocean in a day and cause devastating floods and serious erosion on other islands and on mainland shores that lie in the wave’s path. Island-forming volcanism occurs in association with seafloor spreading, which is the movement of the oceanic lithosphere in opposite directions away from the mid ocean ridges. As a result, oceanic islands occur in three general locations: 1) on the mid-ocean ridge; 2) along edges of oceanic trenches; and 3) above stationary hot spots. The AZORES and ASCENSION are examples of islands sitting on the mid-ocean ridge. JAPAN and the Aleutian and Mariana islands are island arcs occurring on the edges of the oceanic trenches. The Hawaiian Islands are an island chain forming above a hot spot, a location where a plume of magma sits fixed in the mantle, just below a moving lithosphere. Coral islands are made of former coral reefs. Reefs are ridges of rock or coral that are at or near the water’s surface. A coral reef is an accumulation of the skeletal remains of coral polyps (invertebrate animals). Reef-building corals live in tropical waters, so coral islands are in relatively low latitudes. When corals die, their lime skeletons remain behind to build reefs made of limestone. The remains of an immense number of coral polyps make up a single reef. The reefs grow so large and in such abundance that they can become small islands. Geographers call coral islands “low islands” for their lack of mountainous relief. Coral islands appear on continental shelves and in the deep ocean. Continental coral islands are the high parts of large limestone platforms situated on continental shelves. People living in the Caribbean call these islands cays. In FLORIDA, people call them “keys” as in Florida Keys. The islands associated with the GREAT BARRIER REEF in AUSTRALIA are also on a limestone platform. Other coral islands appear far out at sea as atolls. An atoll consists of a ring-shaped island that sits like a crown atop a submerged volcano. The volcano was once an island with a coral reef growing around its outer edge, but the seafloor slowly sank, taking the volcano below sea level. The reef grew upward as fast as the volcano subsided, and thus became a circular atoll. Virtually all atolls are in the PACIFIC OCEAN, owing to the scarcity of volcanism and seafloor subsidence in the other oceans.